A follow-up to Hothead Games' DeathSpank has been announced and will be released a scant two months after the original. If you've already finished action-humor-RPG DeathSpank and have been clamoring for more since putting that last skeleton into his grave (again), Hothead Games has good news. Along with publisher EA the studio has announced the release of DeathSpank: Thongs of Virtue, a follow-up to the original Diablo-meets-Monkey Island game. Thongs of Virtue will put players in the role of DeathSpank again and will task them to seek out the world's six mystical thongs. Yeah, magical underwear. These thongs grant amazing powers to those that wear them, but corrupt all they touch. DeathSpank is the only one that can wear these pieces of rear-end floss without becoming corrupted, so he's mankind's only hope to destroy the undergarments. 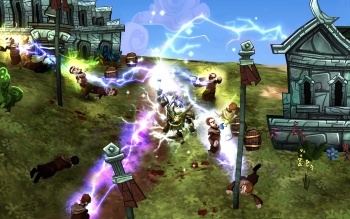 Sparkles the Wizard returns to fight alongside DeathSpank in its local co-op mode, and Thongs of Virtue adds a second co-op choice in Steve, a character with "ninjatastic Kung Fu moves." Vlad Ceraldi, Director of Game Development at Hothead Games, also says the game will "add loads of new creatures, environments, weapons and characters, while continuing to push the envelope with our signature humor." My first thought after hearing of this sequel went to series creator and Monkey Island designer Ron Gilbert, who left Hothead Games in April. According to a GamePro interview with DeathSpank producer Hamish Millar, Ron Gilbert "had basically the same impact on Thongs of Virtue as he did the original game," which means he may have laid down the initial framework for future releases, but Millar didn't explain exactly what he meant. Deathspank: Thongs of Virtue is set for release on September 21 for the PlayStation Network and on September 22 for Xbox Live Arcade at the price of $14.99. There has still been no confirmation of a PC release for the sequel, the original, or for future releases, which is odd considering the game's inspiration coming from two classic PC game franchises.